The seated figures represent the three Muses; the standing figures, the three poets, and Fame blows her trumpet at the top. Three Thornycrofts worked on this rather overblown (good pun?) affair but come 1948 appreciation of its artistic merits had faded and, rather conveniently the Shakespeare and Chaucer statues were found to be in a “battered” condition. The monument was removed and the only known surviving element is Fame which went to Renishaw Hall, the Sitwells' family home. Which raises the question: Why did the Sitwells want, and how did they acquire, this trumpeting lady? Apart from the Park Lane Group we cannot connect the Sitwells directly with this area. We resolved on a Fame-hunting visit to Renishaw Hall. The rich Mrs Maria Mankin Brown (born c. 1780) died intestate on 21 December 1871 at her residence in Hertford Street, Mayfair where she had lived for over 40 years. Her father had been Anthonio Mangini (or Mangin or Mankin) originally of Genoa. He was in London in 1771 and formed a business partnership here in 1800. Miss Mangini was educated in France and towards the end of the 18th century married, with her father’s approval, an American Mr Brown. On her husband’s death she returned to England. Her father died in London in 1803 and due to doubts over her legitimacy she had to fight a legal battle to inherit his estate. She won that battle in 1811 but on her death another legal battle broke out because the identity of her father (through whom the inheritors would be traced) was disputed. This was finally resolved in 1880. Read Martindale and the Evening Standard article for more details (see below). Martindale is a little unclear but it seems that the Metropolitan Board of Works planned to “take” her house in order to widen Hamilton Place. It’s not clear what this meant but Mrs Brown was adamant that it should not happen. Looking at maps of the time we think Mrs Brown’s house must have been on the north-east corner of what is now the Hertford Street/Park Lane roundabout, and that at the time Hamilton Place extended further north through the roundabout and into the road in front of the Hilton. If this guess is correct then we have photos of her house: the north-most part of it is shown at the right-hand edge of one of the photos on this page, the photo without the ruined buildings. The south-most part of it is shown in this 1937 Country Life Images photo, and here the porch for the front door in Hertford Street can be seen. It was the building on the corner, the ruin in the other photo on this page. Since this house still existed when the 1937 photo was taken we have to assume that either the widening scheme did not happen as planned or that the damage was only ever to be the removal of a front garden or just the increase in traffic. The wealthy Mrs Brown proposed an alternative scheme and offered to pay the £50,000 costs herself. 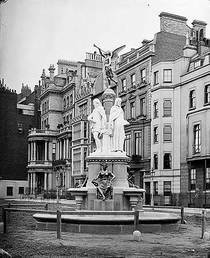 At the same time, and presumably as a sweetener, she also proposed funding the creation of swimming baths in various parts of London and also to create and pay the £5,000 cost of the Three Poets fountain. But she died before any of this could happen. So, although she died intestate, presumably the funds had already been set aside for the fountain (but sadly not the swimming pools). Acton Ayrton (1816 - 86), as the First Commissioner of Works and Public Buildings, organised a competition for the design of the fountain which Thorneycroft won in 1871 (the year Mrs Brown died). The subject for the statuary was probably prompted by concern at the lack of a public memorial to Shakespeare in London, 7 years after the 400th anniversary of his birth, other than that in Westminster Abbey. Interestingly the newspaper descriptions of the winning design suggest that it was not envisaged as a free-standing monument. For example: Fame is placed “in the background” and “at the back of the poets”; Shakespeare is “between Chaucer and Milton” rather than all three poets being of equal importance as they were in the final edifice. Also, the three Muses are not mentioned at all. Which points to the design having been changed before the fountain was created. This makes sense if, as seems likely, Mrs Brown had envisioned the fountain attached to the perimeter of her property, under her “alternative” scheme. But on her death the authorities would have had a freer hand in the design of the scheme, and thus of the fountain also. It’s quite possible that the insult to her house went ahead as intended despite her having effectively paid for it not to be. Chris also told us about a 1964 letter held at Renishaw Hall, written by Elfrida Manning, daughter of Hamo Thornycroft, to Osbert Sitwell. Elfrida wrote that the fountain was designed by her grandfather Thomas and that Hamo had produced for the fountain the bronze Thalia (muse of comedy), his first public work. Reluctantly we dived into Wikipedia's pages on Graces and Muses. Thalia was one of the three Graces but Melpomene wasn’t. Both of them belonged to the 9-strong group of Muses, 5 of which are associated with poetry, but Melpomene is not one of those - all very confusing. But we have found the Classical origin of Fame: Pheme. Described as a tremendous gossip (a woman, what do you expect? Misogyny was rife, even back in the ancient world) she is often confused with Winged Victory - it’s the trumpet that differentiates them. British Newspaper Archive: The Sphere, 22 May 1948; London Evening Standard 26 June 1879. “Martindale's unclaimed money, lands and estates manual : devoted to the interests of all who are in search of unclaimed money, lands or estates, next of kin, heirs at law, legatees, etc." The location of this monument is described in British History On-line as where Hamilton Place and (Old) Park Lane meet. All the images we've seen show it forming a mini-roundabout so we guess it was at the centre of the little roundabout which is there now. The figure of Shakespeare took prime position, facing the park. This monument was erected as part of a Victorian road widening scheme. The north end of Hamilton Place used to be a dead end, not extending far enough north to meet up with (Old) Park Lane. It was extended, across what used to be a corner of Hyde Park, up to this roundabout, to provide extra capacity for traffic. One image comes from Brit Movie who have captured a screen shot from the 1948 film Enchantment. (2018: we saw this movie - this shot is included in the very first image of the film - a left-to-right pan showing the ruined buildings around this monument.) The damage in the background is surely from war-time bombs. The other image, from Historic England, is dated 1875-1900 and taken from a view-point just slightly further to the south. Our source for much of our information is the magnificent work 'Public Sculpture of Historic Westminster: Volume 1' by Philip Ward-Jackson. And what's on the site now? 2016: 3 cherry trees plus one empty pit where there was, until recently, a fourth (confirmed with Google Street View). And at the centre a very decorative lamp-post. The shaft is entwined with branches of oak leaves, and the base with the logo for the British parliament, a crowned portcullis. (A portcullis without the crown is the symbol for the City of Westminster.) With this clue we think the lamppost might be one of the pieces of the bomb-damaged House of Commons, which were acquired by various people in the know, and re-used. 'Wardmote' just means a meeting where decisions are made.